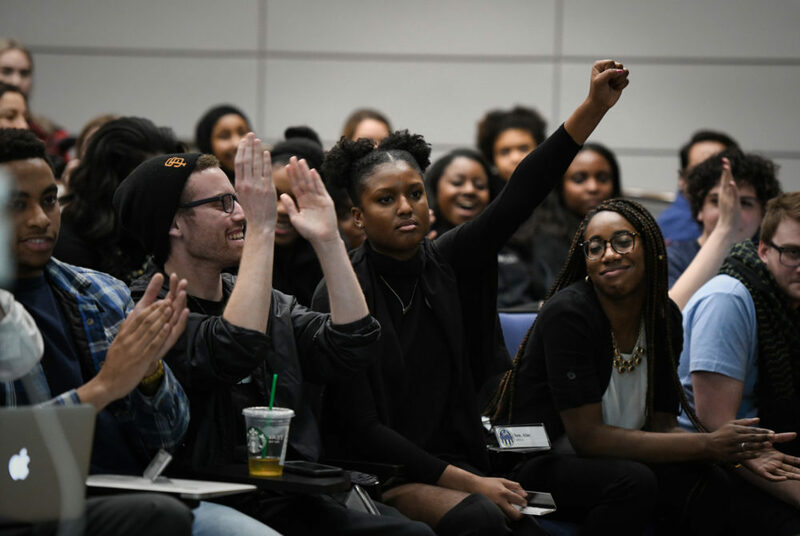 Former Student Association Sen. Imani Ross, U-at-Large, votes in favor of a resolution calling for increased diversity and inclusion efforts after a racist Snapchat post rocked campus in February. Like the years that came before it, 2018 brought no shortage of news to GW’s campus. Student activism dominated headlines this year, starting when students rallied after a racist Snapchat post to call on the University to implement a series of new diversity and inclusion initiatives. Later in the year, students drove the Board of Trustees to approve a free 18th credit and established a new food insecurity task force. On the administrative end, the University restructured its student affairs divisions and cut ties with what was formerly known as the GW Alumni Association. 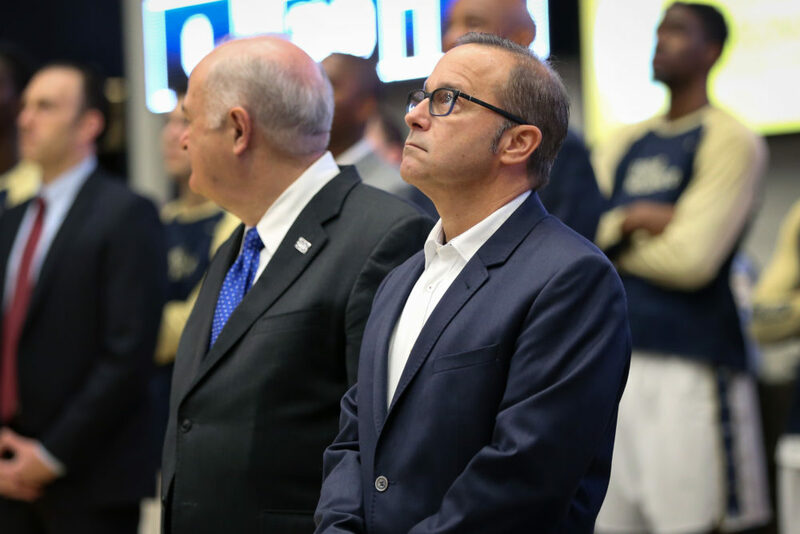 University President Thomas LeBlanc wrapped up his first year at GW’s top post, while a handful of deans have departed. 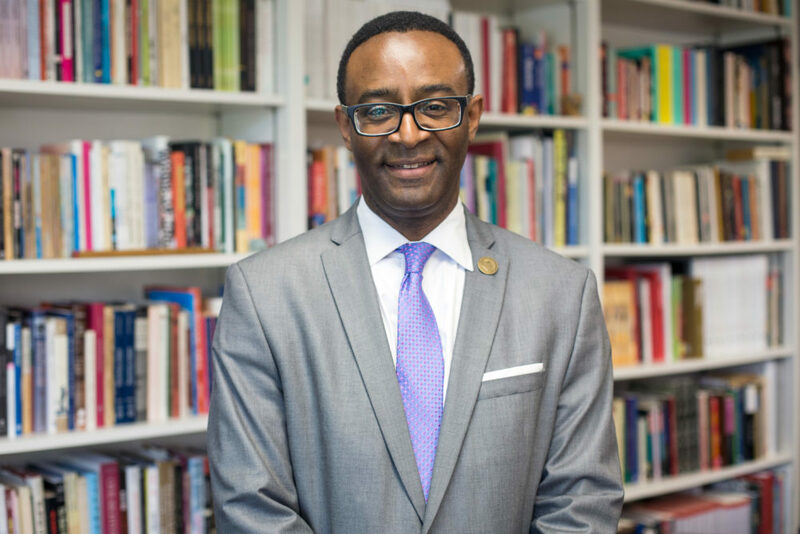 Ben Vinson, the former dean of the Columbian College of Arts and Sciences, announced his resignation in March after he was named as the provost and executive vice president of Case Western University. The year kicked off with the announcement that Ali Eskandarian, the former dean of the College of Professional Studies and the Virginia Science and Technology Campus, would step down at the end of January to follow research and academic pursuits. Two months later, Ben Vinson, the former dean of the Columbian College of Arts and Sciences, announced that he would resign to serve as the provost and executive vice president of Case Western Reserve University. In April, officials announced that Anuj Mehrotra, then a senior official at the University of Miami’s business school, would take the helm as dean of the School of Business. The next month, David Dolling, the former dean of the School of Engineering and Applied Science, said he would resign in August. The University kicked off the searches for the next heads of CCAS and SEAS last month but have yet to launch a search for the dean of CPS and VSTC, which experts said could be an indicator that officials are restructuring the position. Cissy Petty arrived at GW this summer to serve as the inaugural dean of the student experience. Officials announced at the end of January that the student affairs and enrollment divisions would merge into the newfound Office of Enrollment and the Student Experience by the summer, helping to shape University President Thomas LeBlanc’s vision of an improved student experience. 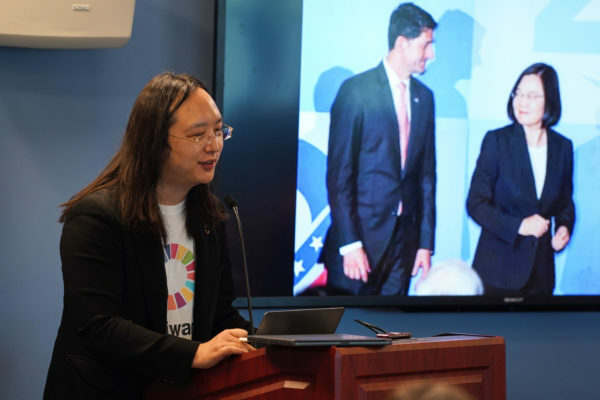 Under the new department, officials created two offices – one focused on collecting data about policies and the other overseeing registration, summer programs and enrollment services. 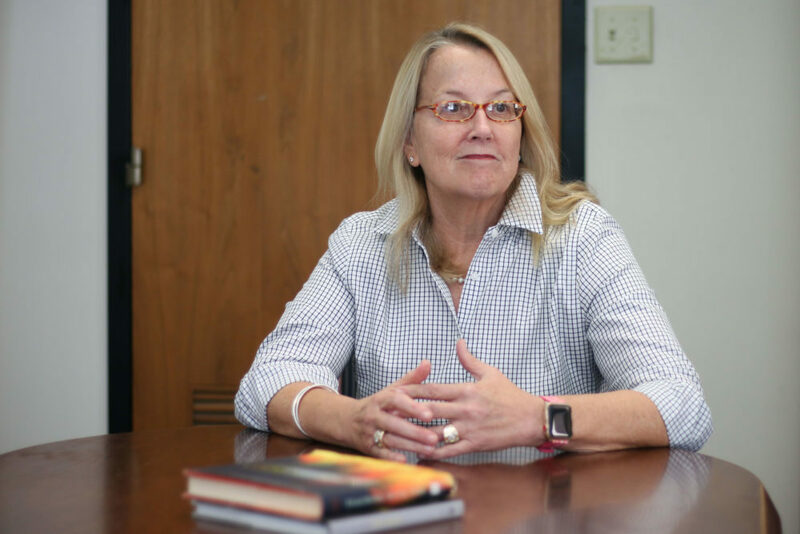 The ESE also welcomed Cissy Petty, the inaugural dean of the student experience, in July. During the administrative shuffle, officials cut two positions formerly held in the division of student affairs: the associate dean of students for administrative services and the executive director of planning and outreach. 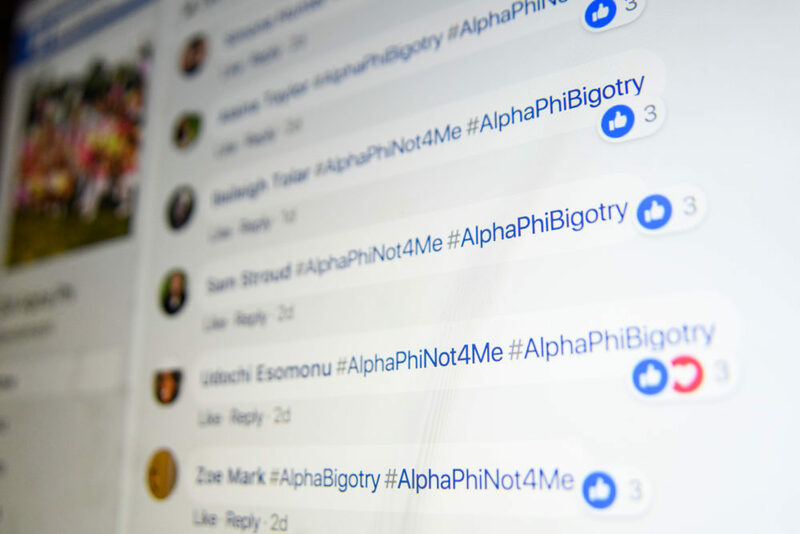 Students used the hashtag #AlphaPhiBigotry on social media after a racist Snapchat post circulated featuring two members of the sorority. Campus erupted in February after students circulated a Snapchat post showing two members of Alpha Phi, one of whom was holding a banana peel, with the caption: “Izzy: I’m 1/16 black.” The post prompted a broader conversation about inclusivity on campus, as student leaders in and out of the Student Association called for systematic changes, including removing Alpha Phi’s chapter, developing a task force to investigate racial discrimination in Greek chapters and adding sections to the student code of conduct to address “racialized” language. Officials promised shortly after the incident to implement a slew of new inclusion initiatives, including mandatory diversity training for all incoming freshmen and an anonymous bias reporting system. Administrators later released a report detailing how the diversity measures would take shape over the next academic year. The Class of 2022 was the first to experience the new diversity training during Colonial Inauguration, and officials hired a diversity and inclusion training director over the summer. Former SA Sen. Shaheera Jalil Albasit, CCAS-G, a sponsor of the divestment resolution, listens as students speak during public comment. The Student Association passed a controversial resolution in late April calling on GW to divest from nine companies that allegedly contribute to Palestinian human rights abuses. The vote added the University to a growing list of student governments with similar calls nationwide – but University President Thomas LeBlanc rejected the proposal the day after it passed. 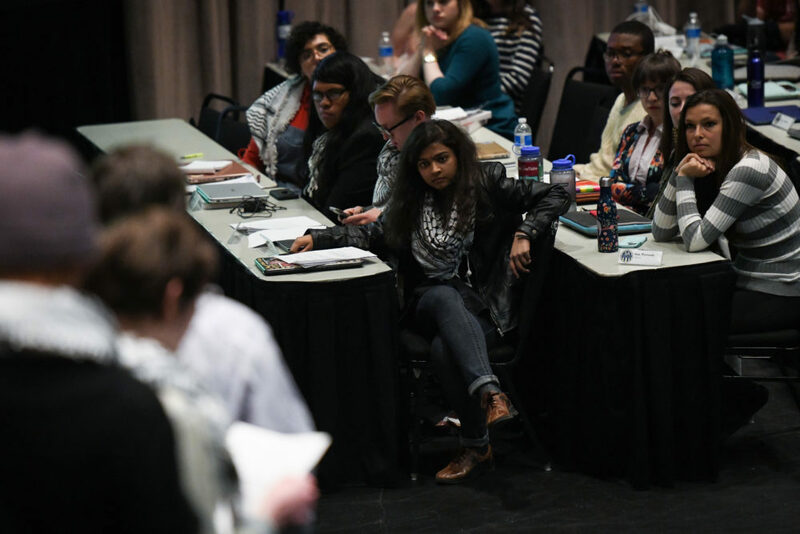 The weeks leading up to the vote saw heightened tensions between the involved groups, and safety concerns forced SA leadership to cancel the original vote scheduled for mid-April. A similar resolution failed in the SA Senate in 2017 by just one vote. 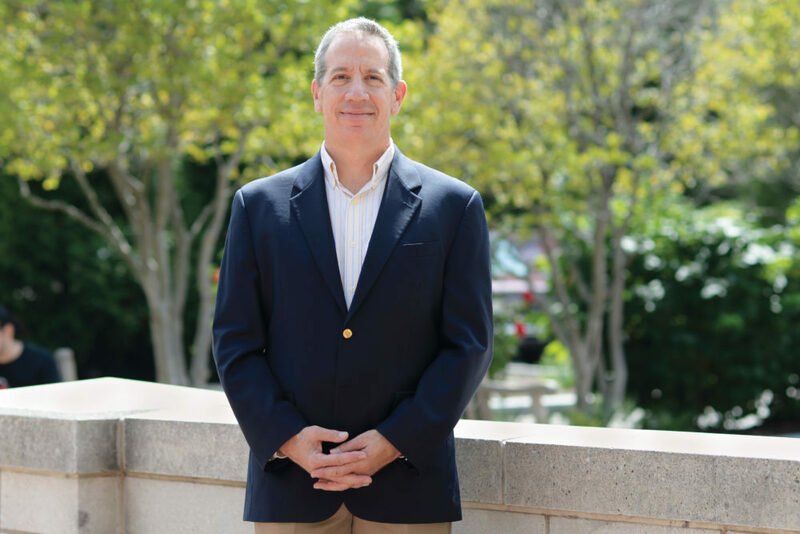 Marty Baum, the president of what was formerly known as the GW Alumni Association, now heads the Independent Alumni Association of George Washington. Former GW Alumni Association President Venessa Marie Perry first announced in May that the group, an independent organization, would merge with the Office of Alumni Relations. 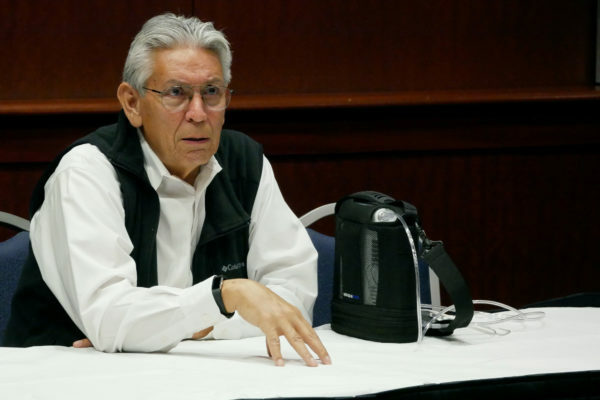 The decision prompted backlash from members of the group’s board of directors, who said the merger threatened the independence of the organization. At least seven board members resigned over the controversy. Amid accusations of poor leadership, the board ousted Perry from her post in July, sparking several additional resignations. With roughly half its original membership, Marty Baum took the helm of the organization and announced that the group would continue negotiating the merger with GW. But after months of conversations, administrators reversed course in September and decided to form their own alumni association. Members of GWAA said they were “blindsided” by the announcement, which also barred the group from using GW’s trademark. After weeks of uncertainty, the organization decided to continue operating as the Independent Alumni Association of George Washington. 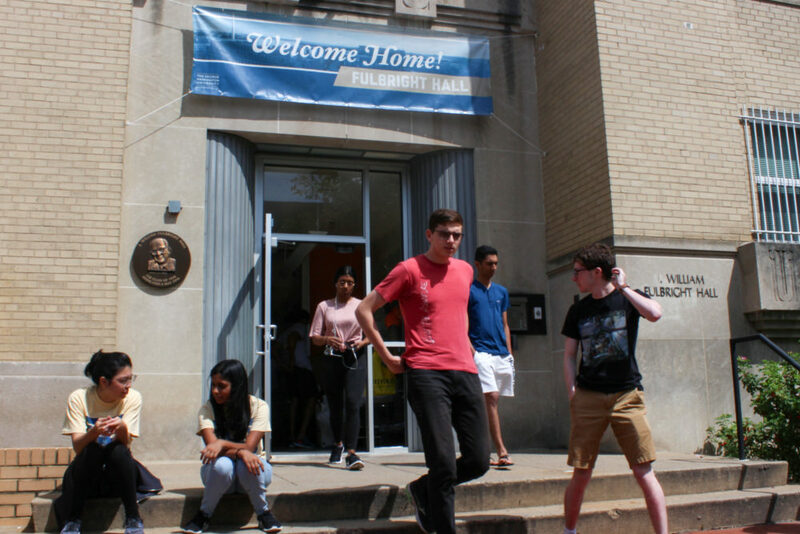 Some first-year students are living in Fulbright Hall – a typically upperclassman building – this academic year after the University welcomed its largest-ever freshman class. No one on the waitlist received an acceptance letter from GW this spring after roughly 2,800 students enrolled. The group is the largest freshman class in recent history and reversed a long-declining yield rate. To accommodate the class, officials designated some floors in Fulbright Hall – a typically upperclassman residence hall – to house first-year students, and at least 15 academic departments also expanded their course offerings. 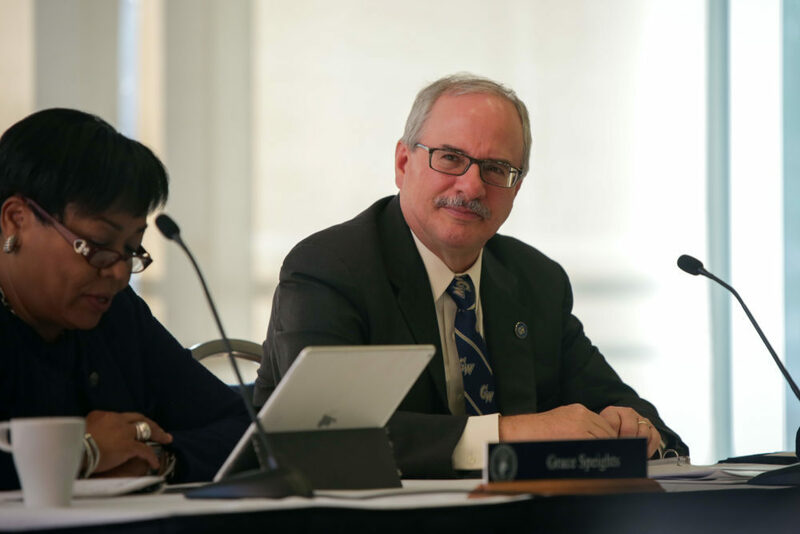 University President Thomas LeBlanc sits at a Board of Trustees meeting in October, during which the Board voted to expand the University’s longstanding 17-credit cap. Students can up their courseload next academic year without paying a roughly $1,500 fee. After officials said in September that they would explore the logistics of upping the 17-credit cap, the Board of Trustees voted the next month to allow students to take a maximum of 18 credits. Student Association leaders applauded the move, which followed more than a year of student advocacy work. About 96 percent of students indicated in a student-wide referendum last spring that they supported the 18th credit, and 54 percent said they would use an extra credit if given the opportunity. SA President Ashley Le won her bid for the association’s top post running on a campaign that prioritized the 18th credit. At the end of last academic year, student leaders also produced a report detailing ways to pilot an increased credit cap. 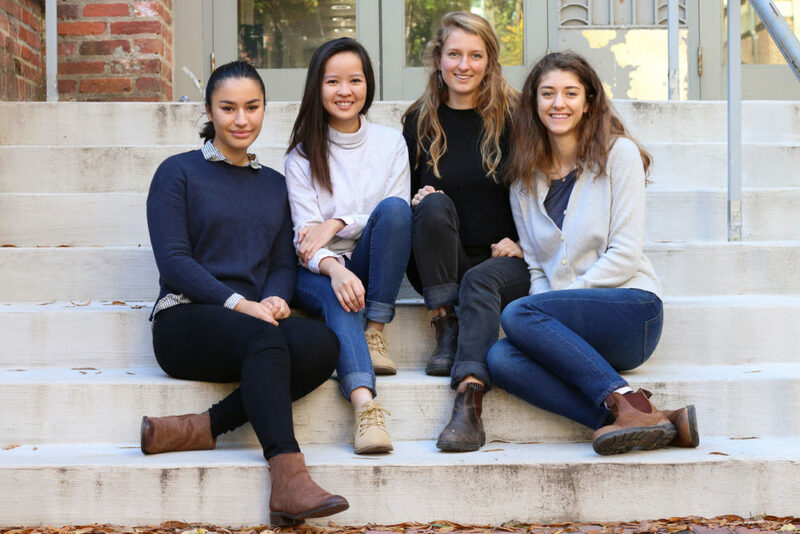 From left: Saru Duckworth, the former president of The Store; Ashley Le, the president of the Student Association; Izzy Moody, the SA’s vice president for sustainability; and Sage Wylie, a former Food Institute Fellow. The four serve on a newly formed task force aiming to quantify and combat food insecurity at GW. Students have presented food insecurity as an ongoing concern for more than a year, and this year has brought substantive administrative and student-led changes to curb the issue. The Board of Trustees upped the amount of cash on students’ GWorld cards in February amid worries that students were still running out of money under the “open” dining plan adopted two years ago. On the student front, leaders obtained a report finding that nearly 40 percent of students at GW are food insecure. The report aids a task force formed last month aiming to track and reduce food insecurity on campus. Former athletic director Patrick Nero was the subject of a detailed Deadspin article last month describing inappropriate encounters with students and an ongoing feud with a coworker. Nearly one year after former athletic director Patrick Nero stepped down from his post, the sports site Deadspin published a detailed article alleging Nero had acted inappropriately with multiple student-athletes, staff members and recent graduates. Anonymous sources cited by Deadspin claimed Nero drank excessively on University trips and offered athletes dinners and money. The Hatchet reached out to nearly 100 current and former student-athletes, coaches and other individuals close to the athletic department to confirm or deny the allegations. Those who responded had mixed reactions to the claims – but most, like the University, remained silent.